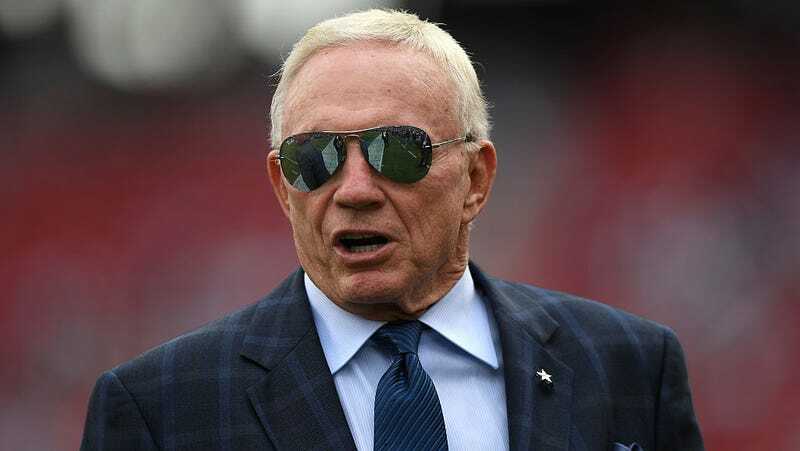 Jones is a member of the 2017 class of the Pro Football Hall of Fame; he is probably the most powerful person in professional football, and has been the most important owner in the league for going on 30 years. It is fitting that he be inducted into the sport’s hall of fame and remembered for his particular influence on the game and the NFL. Every team in the National Football League makes every decision on players to win the ballgame. That is a pretty hysterical statement from a man whose team recently waived a guy over character concerns and then watched as the tipping point of those concerns was revealed to be a case of mistaken identity, but then used media stooges to retroactively smear the player’s work ethic rather than admit their mistake. It is also a baldly ridiculous thing to say about the case of a successful QB who can’t find work in a league full of players who are increasingly publicly advocating for his employment. But, because this is Jerry Jones, it would be foolish to take that statement at face value. It’s an adorable Jerry-ism! Only a fool would accept the literal meaning of this sort of statement from a man as adept with twangy koans as the owner of the Dallas Cowboys. Like all Jerry-isms, this one hides a deeper meaning, decipherable only in the context of Jones’s history as a public figure. And here is that meaning: Jerry Jones is a disingenuous windbag.